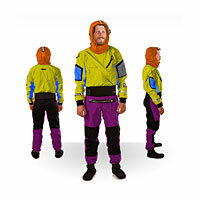 Kokatat now has the ability to build you a custom Gore-Tex® By using the Kokatat Dry Suit Gizmo you can have you suit not only custom taylored to your build but you can also choses multiple colors and options. Here is how it works: Build your suit on the Kokatat website then call us (800-832-4226) or email us the PDF that is generated by the gizmo. Once you pay for your suit we will have Kokatat built it at their factory in Arcata, CA. Lead time is 3-4 weeks and please note that there are no returns on custom Kokatat Gore-Tex® Dry Suits. Height 5' - 5'4" 5'4" - 5'8" 5'6" - 6' 5'6" - 6' 5'4" - 5'8"
Kokatat Custom Order Dry Suits - Gizmo from Kokatat Watersports Wear on Vimeo.